While it may not slap as many points on your record as a felony hit-and-run, repeated DUIs or Fast and Furious-inspired street racing, driving with an expired license is definitely a more serious moving offense than your average traffic ticket. The exact penalty for driving with an expired license varies by state and the specifics of your license-free joyride, but expect some hefty fines that start in the triple digits, plus the potential for even more punishment. Keep these consequences in mind next time you feel like procrastinating that trip to the DMV. Your driving record and the state you live in ultimately affect the penalties for driving with an expired license, but those penalties usually include ticket fines in the hundreds of dollars and points on your record. Commonly, moving traffic violations are considered an infraction, which falls somewhere below a misdemeanor on the crime scale. Infractions, including common traffic infractions liked a busted taillight or failure to wear your seat belt, are usually punishable by fines rather than jail time. That said, driving with a license that is in some way invalid is generally considered a more major infraction or even a misdemeanor crime. And with that comes more serious penalties. Along with the fines and other punitive measures that come with driving without a proper license, all states in the U.S. require retesting after your driver's license has been expired for a significant period of time. That trial includes general driving and traffic law knowledge in addition to road and vision exams. 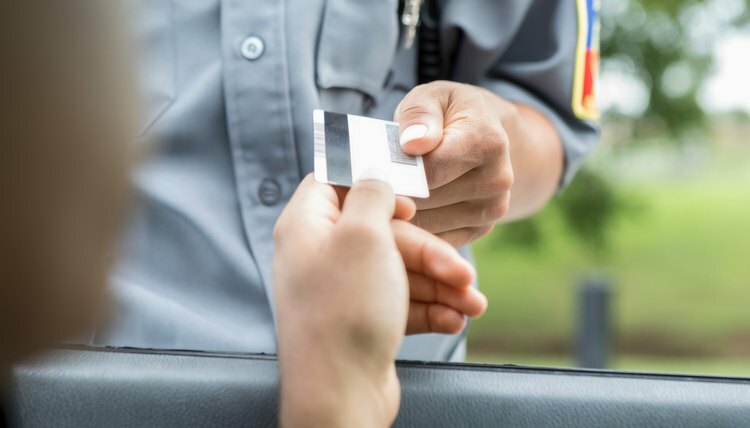 State laws ultimately determine the specific fine for driving with an expired license, not to mention the other disciplinary actions that come with the offense. Although the details and costs do vary quite a bit across all 50 states, there are some big-picture commonalities you can expect to find among those consequences. In most cases, fines hover around the $250, $500 or $1,000 mark, though some states are outliers on either end of the cost spectrum. You may also have your vehicle impounded, which is the legal process by which the car is placed into an impoundment or tow lot and held there until it's reclaimed by the owner, usually at a hefty cost. More than that, getting caught driving with an expired license is sure to leave some serious points on your driving record. Over 40 states use this type of points-based demerit system for auto offenses, in which a weighted point value is assigned to various traffic violations. The value for each offense varies by state, but unlike in golf, more points are bad. Not every traffic infraction results in racking up points, but points you've been hit with from more serious infractions can stay on your record for up to 10 years. Your local department of motor vehicles keeps a record of your points, and law enforcement agencies consider those points when doling out penalties for new infractions. As such, the severity of the punishment may relate to how many strikes you've accumulated. At least one thing about rolling without a license should be pretty clear by now: The fines for driving with an expired license and the related discipline isn't set in stone. In addition to the points system and the variety of fines that can be found in different state laws, the penalty for driving with an expired license changes based on numerous ancillary factors. As a general rule, the punishment will be lighter for a first offense. On repeated offenses, the punishment will increase in severity. The same goes for exactly how far expired your license is at the time of the offense. On the spot, it's often up to the discretion of the officer giving the ticket to determine the fine. So, if your license is only slightly expired, it's entirely possible that the officer will put you back on your way with nothing more than a warning – especially if you show her that the DMV is currently your GPS destination, and you're on the way to get everything up-to-date or if you can provide another valid form of ID like a passport or state-issued photo ID. If you do have a valid license somewhere but not on your person at the time, you might get cited for a "failure to produce" and get what's colloquially known as a fix-it ticket, which requires you to provide proof of license when paying your fine. On the other hand, if your license is way out-of-date, expect the hammer to fall harder, with consequences that may even include jail time. Likewise, if you get charged for driving under the influence and you don't have a license during that event, the charge can be elevated from a regular DUI to what's called an aggravated DUI. The latter comes with a permanent criminal record and possible jail time. But what if you really weren't guilty? If you're ticketed for driving with an expired license, but you have the documentation to prove that you had actually renewed your license at the time you were cited for the offense, you may be able to successfully argue your case in traffic court. This little legal victory may reduce your fines, waive the expired license ticket fee or avoid points on your record. Unfortunately, you may still be liable for any associated impoundment costs – and those aren't cheap. The consequences for driving with an outdated license don't always end at the expired-license ticket. In serious cases, such as a repeated offense or a terribly out-of-date driver's license, the officer may remove you from your vehicle as a way to prevent further continuation of the offense. When this happens, you're probably looking at towing and impoundment fees, too. As per 2019, rates from the Official Police Garages of Los Angeles, for instance, are: towing and the first hour of storage costs $133, each mile towed is $7.50 and the daily storage rate for a standard vehicle is $41.50 if you pay with a credit or debit card. You may save some pennies if you pay in cash. On top of that, you have to pay a $115 release fee, plus a 10 percent city parking tax on the total of all storage fees collected. On a smaller scale, there's always the matter of getting your license back on the legal up-and-up. In some states, you have a roughly 60-day grace period from the expiration date to renew your expired license without facing any additional fees from the department of motor vehicles. In other states, you'll be up against increasingly large late fees after your license had been expired for more than two months. It's not uncommon to have your license suspended, either. California: Fines of $300 to $1,000, possible imprisonment of five days to six months. Up to $2,000 and one year in jail for subsequent offenses. Michigan: Misdemeanor fines up to $500, no more than 93 days in jail. Imprisonment up to one year, fines up to $1,000, cancellation of vehicle registration and increased license suspension period for subsequent offenses. Remember, some states are major outliers, too. Illinois, for example, has misdemeanor fines that start at $2,500 – well above the threshold some states set for repeated offenses – and subsequent offenses can land you a Class 4 Felony, which may include a fine of up to $25,000 – yes, that comma is in the right place – and jail time of up to three years. On the other hand, a first offense in Kansas gets you only a $100 misdemeanor fine and the potential for at least five days in jail. While law enforcement agencies consider the points on your permanent driving record as they scribble out that ticket, insurance companies often use their own bespoke points-based systems (or a standard system based on guidelines from the Insurance Services Office) to keep track of your vehicular violations. Just as past offenses on your record at the DMV can lead to harsher legal repercussions, more points on your insurance record can lead to higher rates. Not only is it likely that your deductible and monthly payment will go up after the insurance company gets wind of your penalty for driving with an expired license, especially after multiple infractions, but once you hit a certain threshold of points, your insurance company may consider you a high-risk policy holder. With that status comes an extra surcharge to account for the insurer's financial risk. Additionally, insurance providers may be able to deny you any coverage at all if you get into an auto accident while driving with an expired license, since you were not legally operating your vehicle. When that happens, it's up to you to pay for any damages to other vehicles – and that might be a deep financial hole to peer into. Suddenly, that trip to the DMV isn't looking so bad anymore, is it? Just bring a book this time. The Law Dictionary: What Is the Penalty for Driving with an Expired License? CarInurance.com: What Is Considered a Minor Driving Infraction, and What Is Considered a Major Infraction? I Drive Safely: Driving with a Suspended or Expired License or No License At All? Ketchum, Dan. "Penalty for Driving With Expired License." , https://legalbeagle.com/5166041-penalty-driving-expired-license.html. 29 March 2019.